Lamar Advertising Company Announces Acquisition of Airport Advertising Contracts from Corey Airport Services, Expanding Media Inventory in Eight Airports Across the U.S.
Baton Rouge, LA – July 11, 2017 – Lamar Advertising Company (Nasdaq: LAMR), one of the largest out-of-home media companies in the world, today announced that it has closed on its recent acquisition of eight airport advertising contracts from Corey Airport Services. The acquisition adds a variety of traditional static displays, dynamic digital displays, wraps and clings, interactive exhibits, and custom advertising displays in eight major airports, enhancing Lamar’s airport advertising portfolio in major cities across the U.S.
Dallas Love Field (DAL) | Dallas, TX – DAL is the home of Southwest Airlines with 15.5 million annual visitors. Louisville International (SDF) | Louisville, KY – SDF draws in thousands of visitors for the annual Kentucky Derby and hosts nearly 3.4 million passengers each year. Palm Springs International (PSP) | Palm Springs, CA – PSP serves as the transportation hub for the resort city of Palm Springs and all destinations in California’s beautiful Coachella Valley. Northwest Arkansas Regional (XNA) | Bentonville, AR – Located near Fayetteville, Springdale and Bentonville, XNA supports growing business travel spurred by Walmart, headquartered in Bentonville. Myrtle Beach International (MYR) | Myrtle Beach, SC – MYR hosts nearly two million passengers each year, most of whom are leisure travelers and tourists. Punta Gorda (PGD) | Punta Gorda, FL – Serving as a regional passenger hub for business and leisure travelers in southern Florida, PGD is one of the fastest-growing airports in the country. Monterey Regional (MRY) | Monterey, CA – MRY serves as a destination airport for tourists visiting the Big Sur and elite resort destinations such as Pebble Beach and Carmel-by-the-Sea. Rick Husband Amarillo International (AMA) | Amarillo, TX – Only six miles from Downtown Amarillo, AMA serves as the largest passenger airport in the Panhandle region. Lamar also has an agreement to acquire the airport advertising contract for Birmingham-Shuttlesworth International Airport (BHM) in Birmingham, AL. Following that transaction, Lamar will operate advertising concessions at 20 airports that serve more than 150 million passengers annually. "We are thrilled to continue expanding our airport advertising business and to bring the Corey Airport Services team on board," said Lamar chief executive Sean Reilly. "Corey has established successful airport advertising programs in some of the nation’s fastest-growing airports. We look forward to extending their proven operating model and to offering our advertisers the most innovative creative concepts in Lamar Airports." Photos: Dallas Love Field wall banner display (left); Palm Springs International Airport arrival courtyard static displays (right). Brig Newman, who served as President of Corey Airport Services, will oversee Lamar’s eastern U.S. airport markets as General Manager. Newman is experienced in all aspects of airport advertising, including the design of airport advertising programs, airport advertising display concept strategy and approval, airport relationship management, and installation project management. Financial terms of the transaction, which closed July 1, were not disclosed. To learn more, please visit www.LamarAirports.com. Founded in 1902, Lamar Advertising Company (Nasdaq: LAMR) is one of the largest outdoor advertising companies in the world, with more than 330,000 displays across the United States, Canada and Puerto Rico. Lamar offers advertisers a variety of billboard, interstate logo and transit advertising formats, helping both local businesses and national brands reach broad audiences every day. In addition to its more traditional out-of-home inventory, Lamar is proud to offer its customers the largest network of digital billboards in the United States with over 2,600 displays. Please feel free to explore our website www.lamar.com or contact us at hello@lamar.com for additional information. Lamar Advertising Company (Nasdaq: "LAMR") will release its second quarter ended June 30, 2017 earnings report before the market opens Tuesday, August 8, 2017. 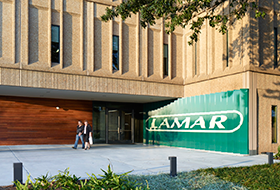 Lamar will host a conference call on Tuesday, August 8, 2017 at 8:00 a.m.
Lamar Advertising Company is pleased to announce the promotions of two key individuals at the company’s headquarters in Baton Rouge: John Miller, previously Vice President and Director of National Sales, has been named Senior Vice President of Sales and Sales Operations, and Rachel Roger, previously National Sales Account Executive, will become National Sales Manager.